Juggling between mouse and the keyboard is not required while managing your store, While sellacious comes intact with many easy to handle Keyboard shortcuts. 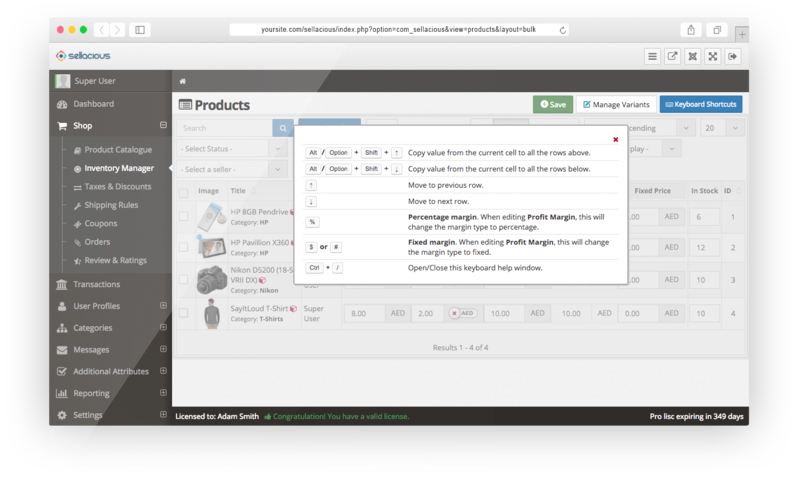 Bulk edit your products without using a mouse, Sellacious provides keyboard shortcuts that make heading up your store a breeze. Stock updation is now effortless and smooth taking least of your time, With Bulk editing feature of sellacious, Updating the stock and inventory as easy as few clicks here and few clicks there, Forget the time-taking process of editing your inventory one by one. Offering variants of products to your buyers should not come as hefty management to you, Want to update the value of multiple variants in a single go? “Manage Variants” options here come at your disposal to let you edit all the variants of selected products without a hitch. Bulk management is even more reliable with you able to manage all your settings of price and margin with such ease and access, Select and filter all the products needed and edit profit or margin in a single go with just a keyboard shortcut to your bestowal.